I met my friend Kim when I started high school in 1983. Her sister Lynda was friends with Nadine and Michelle, my mom’s sisters and so we were instantly drawn to each other through me knowing Lynda. We are still friends today and yet since we were 21 we have seldom lived in the same city. Kim has traveled and lived in many interesting places. Currently she is living in Denmark, a small village in Australia. I have spent a holiday there with her and it is truly beautiful – forests and beaches and greenery. There are cows and wildlife to be seen but the most memorable aspect is that it is very quiet. This solitude is so good for the soul, and one cannot help but want to eat healthy food to nourish your whole being. This cous cous recipe is from Kim, and I have adapted it. Funnily enough, when we were chatting on the phone yesterday she asked me if I had tried it. I had told her that Dave is not a fan of cous cous, but that I had made it regardless and that he ate more than half! 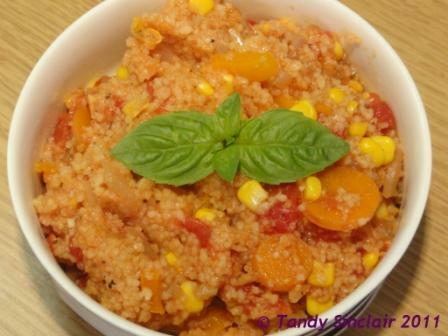 Couscous is so versatile, isn’t it? Particularly with vegetables – this looks very warming with all the yellow and reds.